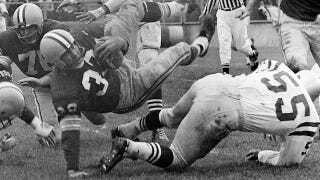 A year ago, just after former NFL player Lew Carpenter passed away at the age of 78, his family decided to donate his brain to a team of researchers studying chronic traumatic encephalopathy (CTE), a degenerative disease often found in athletes who have suffered repeated head injuries. The researchers found that Carpenter, who played for the Lions, Browns and Packers throughout the 1950s and '60s, had an "advanced form" of CTE at the time of his death—even though he'd never been diagnosed with a concussion in 10 years of pro football. In short, concussions might not be the only problem when it comes to CTE. Damage may be caused as much or more by the low-level, or subconcussive, blows to the heads as by the big hits replayed on the highlight shows that leave a player wobbly. "It's the total brain trauma. Tens of thousands of subconcussive blows all add up," [Dr. Robert] Cantu told The Associated Press. "You can't draw a line between number of concussions and risk for CTE. You have to factor in the subconcussive trauma. It's equally — if not more — important." Carpenter's family chose to donate his brain to CTE research because they'd noticed, late in his life, that he had difficulty "finding the right word, keeping things organized, remembering why he was going to the doctor or controlling his temper." As of now, CTE can only be diagnosed in a posthumous brain exam, but its symptoms can include depression, disorientation, and memory loss, and can lead to drug use and even suicide. Cantu estimates that Carpenter could have suffered "between 1,000 and 1,500 subconcussive blows a year, just from practice and play in games," which likely led to CTE. Their findings suggest that football's focus on limiting dangerous hits, contact practices, and committing to more thorough concussion reports is, at least on some level, a fool's errand. Brain damage sustained over a long period of time doesn't make for a video package on the do's and don'ts of tackling in football, but the more "mundane contact," as the AP calls it, could be just as damaging as those vicious hits.